Emirates Insolaire’s highly sustainable, energy-efficient coloured solar panels have been shipped to Europe and the US and will be delivered to Brazil soon, a senior official has said. Rafic Hanbali, managing partner, however, stated that shipments to GCC states had still to begin and were under negotiations. “We started in end 2014, and the deliveries were mainly for certifications and certain users. Overall, deliveries were about 20,000 sq m and our clients included private establishments, installers/distributors and panel manufacturers,” said Hanbali. Emirates Insolaire is a subsidiary of Dubai Investments. “The feedback has been extremely positive, with orders placed for higher quantities. We expect a 100 per cent increase in the volume of sales in 2015,” said Hanbali. The highly-sustainable coloured solar panels – the first-of-its-kind in the world – not only cut down on greenhouse gas emissions but also considerably reduce utility bills. The panels continue to generate lot of interest not only among businesses but also from residents amidst growing awareness and initiatives towards renewable energy sources. The company has received enthusiastic enquiries from the UAE, Qatar, Saudi Arabia, Kuwait, Egypt, Bahrain and Lebanon as well as from Europe, Asia, the US, and Brazil, among other places. The solar panels are in line with the Dubai government’s ongoing initiative to install solar panels in buildings in the Emirate as part of its steps to harness sunlight for conversion into electricity. Given the huge demand for its energy-efficient innovation, Dubai Investments expects sales in excess of 50,000 sq m for coloured solar panels in 2015. Each coloured solar panel, manufactured with Kromatix technology, can generate above 150 watts electric power per sq m on roofs, or above 110 watts per sq m on façades. Approximately 2,000 panels on one building are capable of generating above 350 kW electric power. Globally, the photovoltaic market has grown 40 per cent year-on-year and the number of installations foreseen for 2015 is 160 GW – approximately 800 million sq m of glass. Furthermore, the share of BIPV (Building Integrated Photovoltaic) for roofs and facades, one of the specialisations of Emirates Insolaire, is witnessing one of the fastest growth rates. Hanbali made a presentation on the advantages of integrating Kromatix technology in buildings at the Wetex show in Dubai recently. 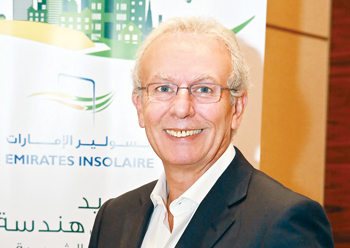 He spoke on the growing trends towards façade solar integration in the Middle East. 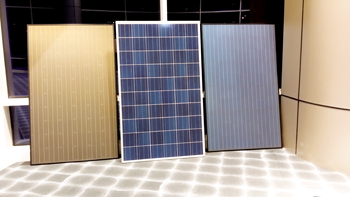 At trade shows in recent months, Emirates Insolaire has been explaining to urban developers ways to adapt its unique, coloured and sustainable solar panels, its breakthrough photovoltaic modules as well as solar thermal collectors to enhance the design appeal and aesthetics of building façades in the region. “There is a latent demand for Emirates Insolaire’s revolutionary, coloured solar panels across the globe,” said Hanbali at a gathering in Doha recently. “Our breakthrough glass is optimised for photovoltaic modules as well as solar thermal collectors and we see a massive growth potential in the Gulf region. The Emirates Insolaire solar glass panels, manufactured with Kromatix technology, are developed in close collaboration with the Swiss Federal Institute of Technology (EPFL – Ecole Polytechnique Federale de Lausanne). Optimised for photovoltaic modules – which use cells to convert solar radiation into electricity – and solar thermal collectors, the glass provides a mat coloured, architecturally aesthetic appearance to solar panels, preserving more than 90 per cent of the original efficiency.